Lindy Hop is the original swing dance. Born in Harlem as a street dance, it evolved alongside the jazz music of the 1920s, 30s, and 40s. Like jazz, Lindy Hop is a uniquely American art form. While Lindy Hop definitely deserves its place in history books, it is still danced today, all over the world! Modern Lindy Hoppers strive to stay true to the joyful spirit and jubilant style of vintage Lindy Hop while continuing to evolve the dance. The one constant is that Lindy Hop, a swing dance, is danced to - you guessed it - swing music! So… it’s like ballroom dance? Shoes: Bring comfortable FLAT shoes with slick soles that allow you to pivot and turn easily. Many dancers like tennis shoes such as Keds. If you already have flat ballroom shoes, those will work great too. Clothes: On any given night at LindyGroove, you’ll see people in jeans and tshirts, people dressed up for a night out — and everything in between. Lindy is an active dance, so what’s important is that your clothes allow you to move freely. Pro tip: You can’t go wrong bringing a change of shirts, towels, and a water bottle. And most importantly: Be ready to meet new people, be active, and have fun — we’ll be rotating partners often. None of our classes require you to bring a partner. Note: Take this class four (4) times, or until completely comfortable with the material, before signing up for Lindy 1. Purchase online at least 2 days before the first class (by Tuesday 11:59 PM) and save $10. Online purchases after Tuesday, save $5. If purchasing at the door please bring cash and allow extra time to register. Price includes admission to LindyGroove. Greetings, new Lindy Hopper! 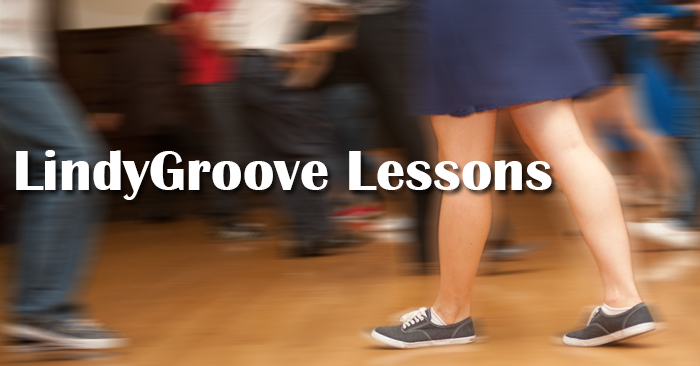 Here you’ll learn the Lindy Hop “basic step” — the swingout — along with new steps and variations depending on the month’s topic. A complete Lindy 1 education consists of 6 months covering Topics A, B, C, D, E, and F.
Note: This is a 6-month long series. However, if you miss a month, not to fear — that topic will come back around in 5 months! Delve into the complexities of Lindy Hop. Go beyond the basics and explore related dances, styling, and musicality. A complete Lindy 2 education consists of 6 months covering Topics A, B, C, D, E, and F.
Need some inspiration? Each week, our instructors will tackle challenging concepts to spice up your dancing. New material every class! Note: Those who have clocked in plenty of hours social dancing will get the most out of this class. Pre-requisites: Lindy Experience helpful but not required. If you miss the first class of the month we suggest that you repeat Pre-Lindy until the next month's series. Here you’ll learn the Balboa basic step along with new steps and variations depending on the month’s topic. A complete Balboa 1 education consists of 6 months covering Topics A, B, C, D, E, and F.
Pre-requisites: If you miss the first class of the month we suggest that you repeat Pre-Lindy until the next month's series. Note: A great use of mini-privates is to social dance with your instructor.